Here are five online businesses you can start for free, with zero investment. All you need is a laptop and internet connection. Any of these ideas could be a part time side hustle, or a full time income. By the way, most of my posts contain affiliate links. That means if you buy something after clicking one of my links I may receive a commission, at no extra cost to you. Thank you for supporting my site! Do you have an eye for design or catchy phrases? Love the idea of creating a physical product that you might even see out in the wild some day? You should look into becoming an online T-shirt designer. Many people are now making big money designing T shirts and similar products to sell on Print On Demand sites. Print On Demand (POD) means that you upload your design file and create an online listing for your product, but the site will only manufacture your product after it’s actually been ordered. The POD site typically handles production, shipping, payment, customer service and returns. You simply upload the digital design file, and get paid at the end of the month for any products sold. So you don’t have to deal with any physical inventory yourself – and there is nothing to pay upfront, since the product is only printed after it’s been ordered. This is an awesome online business model that you can start with no money. The only investment you need is time. There are loads of Print On Demand sites out there now but some of the best known are Merch By Amazon (as mentioned in the video), Redbubble, Teespring and Zazzle. There are no upfront or monthly seller fees on any of these sites. They just take their commission out of any products sold before paying you your cut. I would say the best site to start on is Merch By Amazon because it’s Amazon’s own site and they get amazing organic traffic! But there is an application process for Merch, and sometimes a wait. If you don’t get in straight away just make a start on any of the others. You can upload the same designs to multiple sites. Personally I just have experience with Merch By Amazon. I uploaded a bunch of designs about a year ago and then severely neglected my account as I got too busy with the blog and other stuff. Still, for the last several months I’ve been making about $100 a month in recurring passive income, just from sales of the T shirt designs I uploaded last year. So you can see, there is massive potential in this if you spend enough time. I’ve just started getting back into Merch now that I work from home full time. I’m uploading more designs ready for Q4 and I’m excited to see they’ve added new products such as hoodies and PopSockets! And by the way, I’m not an artist or designer. All my designs are simple text designs that I made in the free open source software Gimp following tutorials on YouTube. This really is one online business idea that anyone can do! Printables are huge right now, and the good news is, they are quick, easy and free to produce yourself. A printable store on an online marketplace such as Etsy can be a great online business idea that you can start for free. Take a look at the printables section in Etsy for more inspiration! You can create the printable products yourself for free, upload to Etsy (or another online store), and enjoy the royalties when your products sell. As with Print On Demand, you don’t have to worry about shipping or inventory. Since there is no physical product to produce, there is no upfront cost. Printables range from very basic to highly decorated. If you have some design talents and software, you can probably come up with all kinds of beautiful printable products to sell. But even if you have no design experience whatsoever, it’s possible to create sellable, practical items. You can create simple printables (think blank templates for meal planning, to-do lists, etc) in a program like Word, save it as PDF, and it’s ready to go. If you want to make something a bit more arty, you can use the free site Canva to create your printables. They even have hundreds of templates ready for you to adapt and make your own. There are sites such as Pixabay where you can find free clipart and design elements to use in your products (but please check the licensing info carefully for any image you intend to use in a product for sale). You can sell your finished printables on sites such as Etsy, Shopify, or on your own website. I would recommend Etsy to start with because there are no monthly seller fees (although there is a very small fee per listing). I enjoyed this detailed case study by someone who makes $2,000 a month in passive income from their Etsy printables store! I started blogging two years ago as a hobby, working on it in the evenings and weekends around my office job. Two years later, I was making more money from my blog than in my job… so I quit to become a full time blogger! Now, as I said, it took me two years to get to that point. Blogging is not a quick and easy route to riches. You really have to put in a lot of work upfront before you start to see results, and there’ll likely be plenty of times when you feel like nobody’s reading your blog and you want to quit. But I’m proof that it can be done! I absolutely love blogging – the flexibility, the creativity and the ability to build your own business from the ground up, with nothing but a laptop. When I tell people I’m a blogger, most people want to know how bloggers actually get paid. But can you start a blog with no money? The short answer is yes. Don’t get me wrong, blogging can be expensive if you let it be. I usually recommend starting your blog as a self-hosted blog on Siteground (that’s what I use). I know people who’ve spent hundreds or even thousands upfront on custom themes, tech services, graphics and courses. I am a member of this blogger training site and I can testify that they are really good for beginners. They give you not one, but two free blogs, free themes (templates to change the design of your blog), and even free training to get your blog set up and decide what to write about, and introduce you to the basics of affiliate marketing (affiliate marketing is how my blog makes most of its money). There is also a truly excellent community and support system so you can ask all your questions and get tips and motivation to move forward. The site also has a paid option which gives access to a lot more classes and training to take your blog to a higher level. But you can keep your two free blogs and enjoy lots of the other resources without the paid membership. What’s the difference between these free blogs and a paid, self-hosted blog with Siteground? Well, if you go the self-hosted (paid) route, you can get your very own domain name (web address) that can be anything you like – mine is www.boostmybudget.com. With a free membership at the site I recommend, your web address would have an extra bit on the end like this: boostmybudget.siterubix.com. In my opinion, it doesn’t look quite as professional, but it doesn’t stop you making money. And you can easily change it over to a plain .com web address later if you like, once you’re ready to invest a bit. This is a great way to test out blogging for free and see if it’s for you. Click here to get your two free blogs and start your business for free today. Fiverr is a well known hub for common freelance services such as design, writing, translation and programming. But you don’t need any special skills. You can sell almost anything you can think of on Fiverr! For example, this guy records personalised messages dressed as Jesus (and has made almost 800 sales!). This one sings happy birthday – very badly. This one will send you pictures of his cat and this one makes memes. There are no upfront seller fees on Fiverr, so this is another money making idea you can start with no money. The site just takes their cut out of any sales you make. 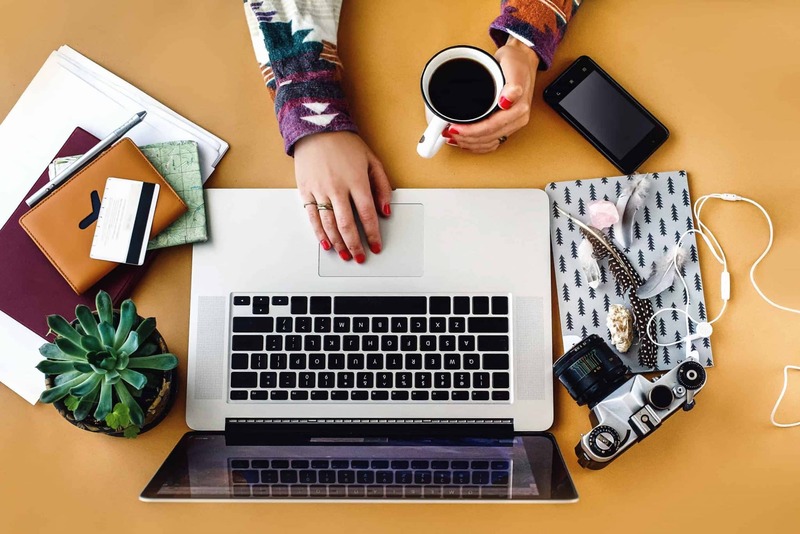 Freelance writing is an easy way to get started making money online with no investment needed, and no equipment other than your laptop and an internet connection. There is a huge and growing demand for written content online, especially with the growth of the blogging and SEO industries. And there are plenty of opportunities for anyone with good written English. The toughest thing with freelance work is starting out. It can be hard to land that first client, before you have any experience or testimonials. Be prepared to work for less money until you start to build up your reputation and client base. One site to start out getting content writing work is Textbroker. It’s easy to sign up, even with no experience. The pay is low, but the assignments are usually not particularly in-depth, so if you can write fast you can do alright. The pay also increases as your ‘quality rating’ goes up. Once you have some experience you might want to look for your own clients where you can set your own rates. To earn even more money, it’s worth getting into a particular niche such as finance, grant writing or technical writing. The more specialised your knowledge – and the more experience you have – the more you can charge. Also take a look at this post for more info on getting started as a freelancer. Have you tried any of these business ideas? Any more ideas for businesses you can start for free? Great list! And I’m so encouraged to hear that you were able to leave your job to be a full time blogger! That’s the dream!